Her names means beautiful and radiant in Arabian. Zaynah is an incredible story of perseverance. 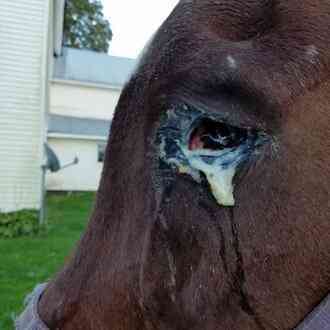 An emaciated mare with a terrible eye injury dumped at auction! Only to find out now that she was also pregnant! 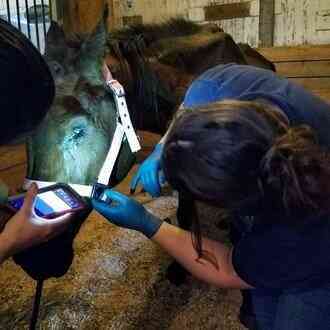 Help us get her all the care she needs - as well as her foal. 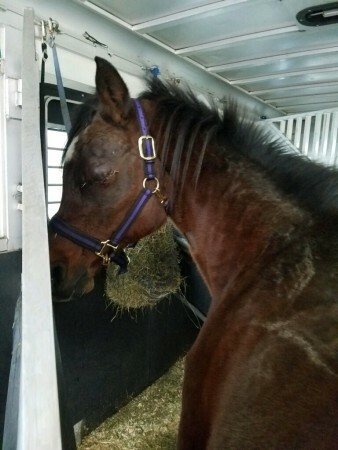 She came to us from End of the Line, a Kill Pen Horse Placement organization in PA.
Zaynah has her baby boy! You were interested in Zaynah's story and we wanted to share the great news! Her baby boy arrived last night. He's tiny, but healthy. Mom and baby's healthcare costs continue to rise. Please help us help her. Donate what you can and share her story with the wonderful folks you know. 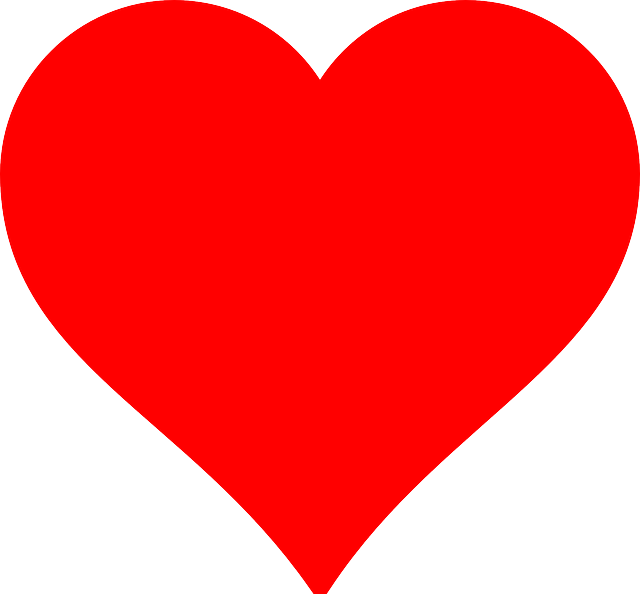 You are all a blessing to us and we thank you. Your generous caring helped make this day happen and we wanted to make sure we shared it with you. Her precious boy arrived last night. He's tiny, but healthy. Mom and baby's healthcare costs continue to rise. Please help us help her. 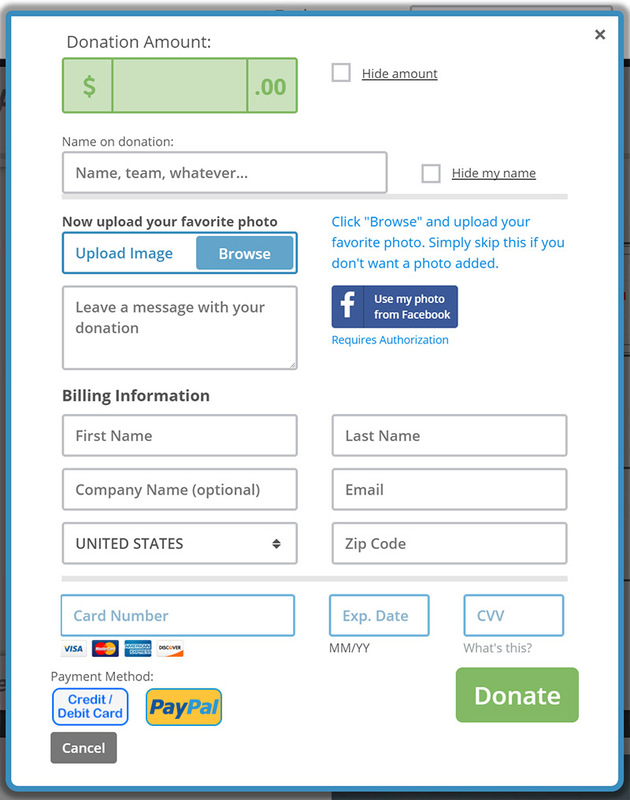 Donate what you can and share her story with the wonderful folks you know. You are all a blessing to us and we thank you. We want to thank you for your support of Zaynah and let you know how she is doing. The vet visited her on Friday, November 30th and removed her stitches. 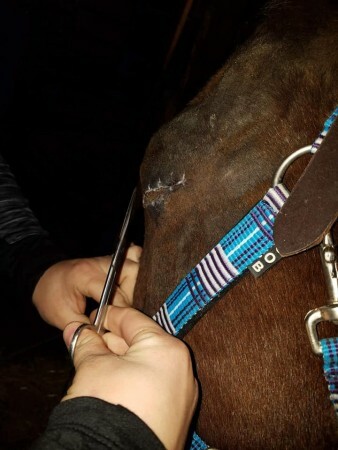 Her wound is healing well and horses are known to do just fine with one eye. She seems to have adjusted already. 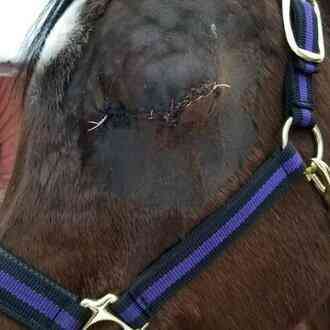 With the infection gone and the wound healing she should feel much better. Even though she has been through an incredible ordeal, her foal seems to be fine and her pregnancy is progressing on schedule. She is receiving excellent care from Cindy Noll and her team. They are also anxiously awaiting the new baby. The veterinarian said again that she should deliver in 4-6 weeks. We will keep you posted. Thanks again for letting her touch your heart. You reacted to her story and/or shared it with your friends. 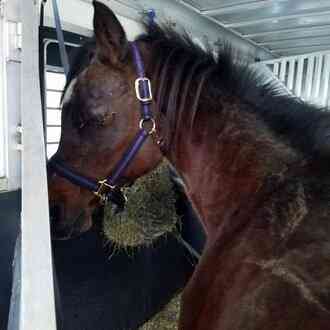 Please continue to share her story so that we can raise the money for the care of her and her foal. We want to thank you for your generous support of Zaynah and let you know how she is doing. The vet visited her on Friday, November 30th and removed her stitches. 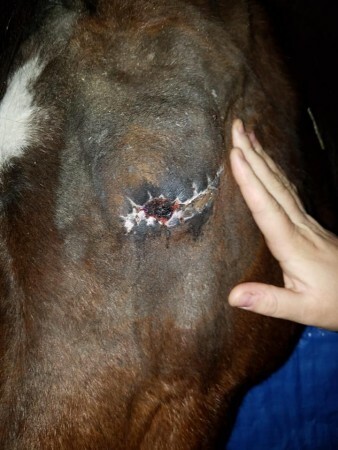 Her wound is healing well and horses are known to do just fine with one eye. She seems to have adjusted already. With the infection gone and the wound healing she should feel much better. 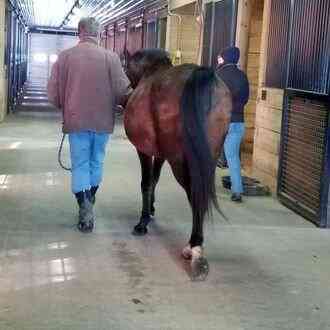 Despite her incredible ordeal, her foal seems to be fine and her pregnancy is progressing on schedule. She is receiving excellent care from Cindy Noll and her team. They are also anxiously awaiting the new baby. The veterinarian said again that she should deliver in 4-6 weeks. We will keep you posted. Thanks again for letting her touch your heart and for opening your wallet to make a difference. Her round the clock care costs a lot of money and we simply couldn't do it without people like you. 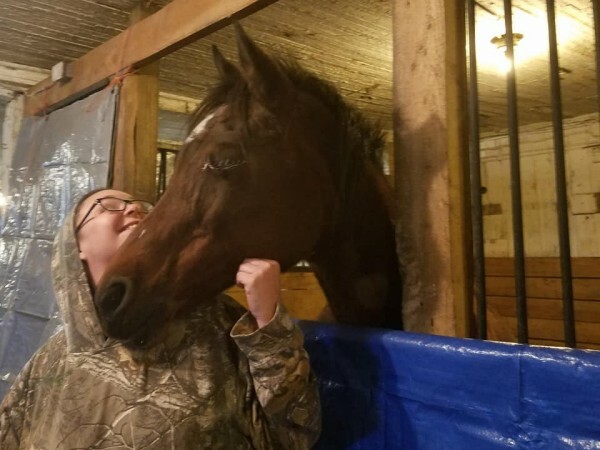 Please continue to share her story with friends and family so that we can raise the money necessary for the care of her and her foal. Zaynah the little emaciated Arabian mare with a terrible eye injury, dumped at auction is pregnant! The veterinarian estimates delivery in 4-6 weeks! She is so thin that you cannot tell she's pregnant. Unfortunately, we did have to end up removing her eye. The surgery went well. Please donate so that we can continue to give her the proper care. Can you imagine the scene? Her skinny frail body in foal with an injured eye going thru the auction with a note saying older mare, she rides real nice! How callous can people be? Her unborn foal is now finally receiving proper nourishment. We have no idea who she was bred to. It's certainly a miracle - with another miracle on the way! Her care costs are rising rapidly. Her operation cost around $1500. 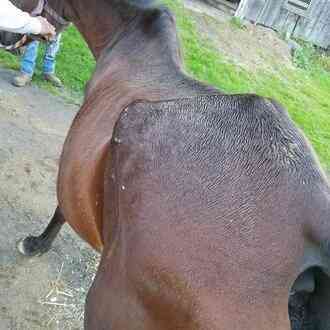 Her recovery and the birth of her foal will cost at least $3500. This includes the cost of keeping her in full time care through the birth, veterinary costs, etc. The first 3 pictures are her "before" pictures. Now you can see her after eye surgery and her big round belly. As well as how well she has been filling out with excellent care! We do promise that 100% of your donation goes directly to Zaynah and her foal. We hope you understand and give when and what you can so we can continue to help these magnificent creatures. Zaynah after her eye removal surgery.